All birthdays are special, but a baby's first birthday is even more so because it heralds the transition from babyhood into the toddler years. Mark this occasion with a bit of poetry that can be added to a card, video recorded as a quick speech before lighting the candle on the cake, or preserved on a birthday scrapbook page. Even if your child doesn't remember a thing about the day, you'll have a keepsake to share as you look back together and reminisce. First birthday poems like the ones offered here can express so many thoughts and emotions about a special child who is turning one. How fast time has flown. But how quickly you've grown. You have conquered it all. The time has come and you're turning one. Your little life has only just begun. And richer with all the amazing things you'll do! Yesterday a baby, now today you're one. Your toddler years have now begun. Full of laughter and fun, a real sensation! We'll start planning for the day you turn two! And all the richer because you are here. And your wobbly legs are learning to walk. And each time you smile, another heart you win. So we're celebrating your special day. This birthday is first of many more on the way! And she is ready to have some fun. Her head is topped with a birthday crown. For this pretty little birthday queen. Gather to wish her another happy year. You play our heart strings like a violin. Have a one-derful birthday little guy. You're the apple of everyone's eye. You're the best, and everyone knows! If you'd like to see more examples, the following websites contain poems that reflect the first birthday theme. 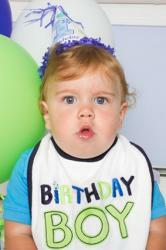 Birthday Poems and Quotes has a special section for babies who are turning one. Their verses vary in length from one stanza to much longer poems. Some are geared toward a specific gender, but most can be used for boys or girls. All Best Messages also has a collection of poems to go with first birthday celebrations. The poems are mainly short, and several could be used in your party invitations. Verses4Cards has more than two dozen first birthday poems dealing with all aspects of the occasion from baby's cuteness to how fast that first year went to components of the party. Some are fairly short while others contain several stanzas. If you feel inspired by the poems presented, you might even want to try writing one of your own. Take some time to reflect on the first year of your baby's life and then try writing a verse or two. You don't even have to rhyme; just write what's in your heart and find a way to include it in the celebration.